Sidewall introduction in the conveyor belt has made the conveying of the powders and lumpy material an easy task, by which means user can transport high amount of the material without any risk of the spillage and ultimately material loss. This sidewall conveyor belts is broadly used in the steep angle conveying and therefore the design & quality of thereof is paramount in order to ensure the impeccability of the operation. Owing the demanding requirements of the steep conveying, we manufacturer of the side wall conveyor belt has carried out specifically designed & engineered conveyor belts with corrugated sidewalls to ensure highest elongation at the flexing points, and therefore is also eminent as the corrugated sidewall conveyor belts in the miscellaneous industries associated with the steep angle conveying. This corrugated sidewall conveyor belt has not only proven its effectiveness against high stress, but also has proven to be an excellent approach for its high durability, high tensile strength, lower maintenance, and longer lifespan, and all this attribute is an outcome of our top grade PVC/PU material used in the construction. 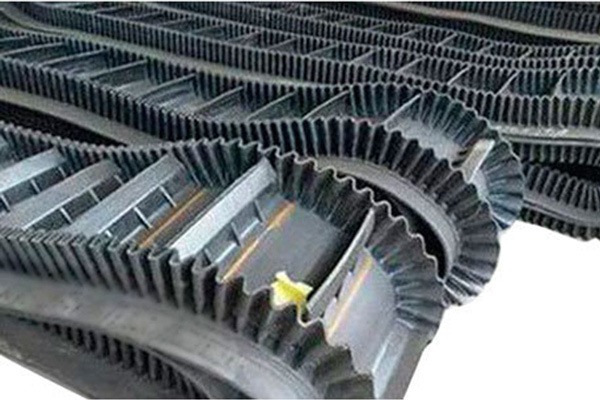 This corrugated sidewall is fused with the flat PVC/PU conveyor belt by adopting the best in class vulcanization process that ensures permanent adhesion of cleats & sidewalls even under the heavy duty operations and therefore our corrugated sidewall conveyor belt is being the reliable companion of the hundreds of industries for saving maintenance cost and production loss. Every sidewall conveyor belt is passed through rigorous testing against abrasion, chemical, tear, corrosion, water, heat and different parameters make it best bet in every industrial application. The offered side wall conveyor belt already have its strong roots in the ceramic, chemical, metallurgy, coal, construction, port, agriculture, mining, recycling, and casting industries for delivering impeccable conveying experience at the lower cost. If you are facing the conveying problems and looking forward for the high quality corrugated sidewall conveyor belt that prevents spillage, lower maintenance and increase efficiency, then our side wall conveyor belt prove its worthiness. Our corrugated sidewall conveyor belt is available in the widest array of the assortment, and also available with a specific size of cleats upon request. Other than, we are specialized in the custom made conveyor belt, wherein we design and develop a side wall conveyor belt that perfectly matches your requirements. Our both ranges of conveyor belt are as per the ISO quality standards and also accredited by the FDA and hence it is also suitable to use for the food application without any skepticism.